T-Ball registration occurred last Sunday. If you have missed the registration opportunity, you can still turn in forms, but it needs to be done quickly. Go to www.minonkparksandrec.com and click on the "registration forms tab" at the top. Use either the instructional softball or baseball form as the T-Ball form is not currently working. There is a spot to mark for T-Ball. Fees are $25 for the first child, $20 for the second or if you have a child in a instructional level. These can be turned into City Hall during business hours, or put in the City Hall drop box if after business hours. It would be great to have all the forms in by the end of the week. The new nature trail looks exciting. In my mind, I can still see the miners coming down the road after digging coal all day 500 feet below ground. Some would be walking carrying their lunch buckets. Others would rent riding space in the few cars owned by other miners. Four would rent seats inside the car. Three sat in the back seat and one in the front passenger seat. These were the premium spots, especially when snowing and raining, and demanded the highest fees. Two miners stood on each running board located on the sides of the car. They payed less and of course endured the full force of snow, sun, rain, sleet, and wind. The cars of that day had distinctive front fenders with lights mounted on the fenders. The fenders were rented also. A miner would straddle each light sitting on the fender. Up to eleven men including the driver could be riding in one car. This procession would generally let the men off at the Sutton gas station which was located just south of what is now the Tjaden building on north Chestnut street. That's where my brother Jerry and I would meet our dad to walk home with him. 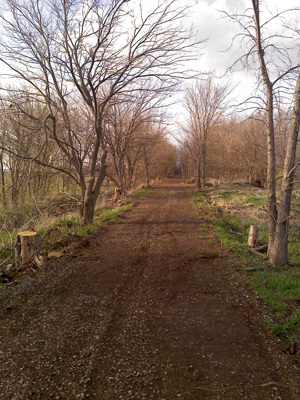 Be sure to thank the mayor and council for saving this strip of Minonk history and the City workers for bringing the Trail back to its former self. Also, take your kids on a walk and explain how this Trail represents the sweat and even blood of former generations that made Minonk history. Thank you so much the beautiful write up on my mom, Donna. She battled her cancer and handled herself quite well with her illness. She . was a true testimony to me and I hope an inspiration to others. She is deeply missed and was loved very much by her family and friends. I found a wild turkey in my garage this am. It took awhile to get out but it finally did and boy did it run fast to get a way. The Minonk Knights of Columbus will hold an Easter Egg hunt on Saturday, April 23, 2011 at St. Patrick's Parish Hall. The Hunt will start at 10 a.m. If you plan on attending, please come 10-15 minutes early so the kids can be arranged in their age groups. Prizes, cookies and Kool-aid will be served in the hall following the hunt. Bring your Easter Baskets to put all the goodies in. Hope to see you there, it's alot of fun to see the kids run around and collect their candy. Does anyone know who won the 50-50 drawing, or any thing the was raffeled off at the breakfast? Thank's fred. Just a reminder that the town-wide garage sale is being planned for Saturday, April 30, 2011 from 8:00 a.m. until 2:00 p.m. If anyone is interested in participating in the Town-Wide Garage Sale sign up forms are available at Pop's Sweet Shop, or here at www.minonktalk.com. To have your sale advertised in the map you must fill out the form with the $4 for advertising, etc and return both to Cathy McKay, 626 Locust, Minonk. I think this is great and talk about bringing back memories. We use to love to ride our bikes to "the Jumbo" and climb it. I can't wait to come back "home" for a visit and walk that path. I hope everyone takes advantage of it. Thank you so much for the beautiful write up on my mother, Donna Eilts. Our family was truly blessed to have her in our lives and we are glad she was a part of Minonk History. She really enjoyed researching and finding nostalgic information on the town. This is a reminder that the Minonk Reunion Group is spending a few days in Las Vegas next month. We will be staying at the Monte Carlo on the Strip for three nights beginning May 23. If you can join us, please contact the hotel at 1-888-529-4828 or go to their web site (just search Monte Carlo Las Vegas and you will find it). Several good shows are in town (i.e. Phantom o the Opera and Lion King plus others), Hoover Dam is close by for tours, there are lots of hotels to explore, and more. Please let me know if you are planning to be there so that I can include you in our dinner plans. I have seen flyers at Casey's advertising Easter egg hunt(s) in Minonk. There is one at Heritage Mannor, and I can not remember where the other one is. - The flyer was still up this morning (04/08/2011). Hi Dave, do you know if there is an Easter egg hunt in Minonk this year? I haven't seen anything around town recently. Thanks. Editor's reply: I don't know of any plan's for an Easter egg hunt. Does anyone else know?